After a long and grueling winter season, it came as no surprise that Memorial Square was buzzing this weekend with people excited to celebrate the coming of spring. 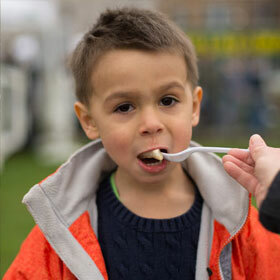 The Spring Thaw event has been a staple in the Downtown Barrie annual event line up for five years now, encouraging everyone to venture downtown to indulge in fluffy pancakes with local Farmer’s Market maple syrup, and activities for all to enjoy. In an effort to reach more people and to connect more directly with local businesses, this year’s event was held at Memorial Square within Downtown Barrie’s Main Street. 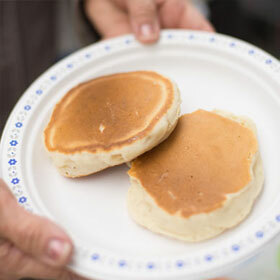 And despite the cool and rainy weather, the downtown core was singing with live local music, laughter and the sizzling of pancakes over a hot grill. The rain loomed large on Saturday morning as the flat tops were fired up, aprons were dawned and the batter was being whipped up. Ultimately, if it weren’t for the help from the Grilled Cheese Social Eatery, the event might have been in jeopardy. 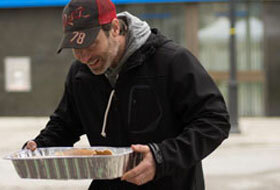 But Randy opened up his kitchen and more than 1000 pancakes were served to an eagerly awaiting crowd who were lined up along Dunlop Street. At one point the Grilled Cheese Social Eatery kitchen was pumping out pancakes and sandwiches at the same time – talk about community collaboration. By mid-morning, you could feel the warmth of spring or maybe that was election fever, as politicians from every level stopped by to lend a hand. 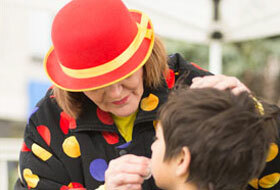 All around were fun activities to keep the many families entertained and busy. There was a face-painting tent where you could transform into a princess or a monster, a mini golf course designed to make everyone a winner, bouncing castles that encouraged laughter, and horse rides that wound through the streets of downtown just like the days of long past. A new element this year’ was the Spring into Downtown event which included some forty retailers along Dunlop street. During the afternoon many businesses opened their doors to workshops, live music, sample booths, demos and gifts. Participating retailers were decorated with green balloons to let people know that something special was going on inside. It truly felt like a treasure hunt in Downtown Barrie that kept you wandering from store to store. The new location at Memorial Square, the family-friendly activities, and the community coming together to support one another, all contributed to another successful event. The bar has been set and next year will only be better, and who knows, maybe a grilled cheese sandwich made with pancakes and maple syrup will make its way onto the menu at the Grilled Cheese Social Eatery.